No Ifs, No Buts, No Maybes - Be There! Woo Them, Or Lose Them. Lies, Damn Lies, and Mainstream Media Polling. 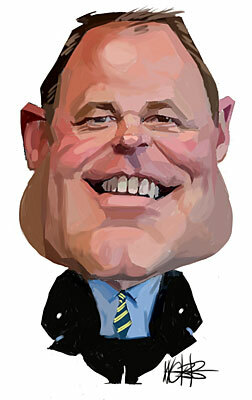 Puffed-Up Political Popinjay: Associate Minister of Education, Craig Foss. The Member for Tukituki epitomises the National Party's almost reflexive antagonism towards urban culture and the free life of the mind which it promotes. Mr Foss's neoliberal ventriloquists are determined to dismantle the democratic and egalitarian education system set in place by the First Labour Government. SEVEN YEARS AGO Craig Foss made his living manipulating money for Credit Suisse Financial Products. Before that he had, like his leader, John Key, been a currency trader. In 2005, after heaving Labour’s Rick Barker out of the provincial Hawke’s Bay electorate of Tukituki, he became a National Party MP. National had been odds-on favourite to take the seat, but everyone agrees Mr Foss worked tirelessly to make it a certainty. He was perfectly cast for the role. The election of 2005 marked the first surge of the king conservative tide which would sweep away practically all Labour’s representation in the provinces and seriously erode much of its urban base. To the conservative voters of Tukituki Mr Foss’s jutting chin, porcine squint, and querulous pout communicated the confidence of the self-made man who understands the value of Pounds, Dollars and Euros – but very little else. This lack of cultural depth was anything but a handicap in Tukituki, where the Clark Government’s intelligent social liberalism had long since outworn its welcome. Mr Foss may have spent much of his working life in the world's financial hubs, but his values remain firmly rooted in the socially conservative Hutt Valley suburbs of the 1960s and 70s, where he was raised. BEING A TORY in the Hutt Valley of that era can't have been easy. Surrounded by one of the largest concentrations of industrial workers in New Zealand, the besieged defenders of free enterprise who triennially defied the Labour-voting hordes must have felt like political refugees. Their true home wasn’t the Hutt, seething with socialists, but out there – in the Heartland. In all those decent, hard-working provincial towns. In all those leafy city suburbs. That’s where “real Kiwis” lived, well-fenced against trouble-making trade-unionists, subversive secondary-school teachers and condescending academics. It’s this almost reflexive antagonism to urban culture that turns most National Governments into dreary re-runs of The Heartland’s Revenge: a dull-witted drama punctuated by repeated acts of petty social vengeance. Think Murray McCully’s dismantling of MFAT; Paula Bennett’s axing of the Tertiary Assistance Grant; Steven Joyce’s sabotage of public transport; and Bill English’s pogrom against public servants. Most of all, think of the entire National Caucus’s hatred of education. Nothing epitomises the Tory mind-set more completely than its attitude to learning. The essence of conservatism is its love of boundaries. People are supposed to stay where they are put: the rich man in his castle, the poor man at his gate. Workers, Maori, women, children: each must remain in their allotted social space. The only legitimate vector of social mobility is wealth. Work, by itself, will not set you free: but work attached to bundles of cash just might. Of course, money is not the only source of freedom. The human mind, liberated from ignorance, prejudice and superstition, bestows upon its owner a very different sort of wealth. Education has the power to dissolve boundaries – which is why conservatives hate it with such passion. Why else would National have withdrawn the funding that allowed schools and polytechnics to offer night classes? Why else would they, against the advice of their own experts, have introduced “National Standards”? Why else are they underfunding our universities and attempting to turn them into purely vocational degree factories? What else could explain their extraordinary contempt for public service broadcasting? Their enthusiasm for dumbed-down, commercially-driven programming? The free life of the mind is anathema to the National Party, and everything which contributes to that freedom must be destroyed. [T]hat every person, whatever the level of his academic ability, whether he be rich or poor, whether he live in town or country, has a right, as a citizen, to a free education of the kind for which he is best fitted, and to the fullest extent of his powers. The swiftest and most effective means of destroying such a system is simply to place it in the hands of private, profit-seeking businesses. Identifying the system’s weakest performers by using NCEA pass-rates and National Standards test results will allow private-sector investors to pinpoint the prime locations for National’s new, taxpayer-funded “Charter Schools”. The construction of these new institutions will offer further opportunity for private profit in the form of Public-Private Partnerships (PPPs). WHICH BRINGS US BACK to Mr Foss. At the end of last year John Key made the Member for Tukituki Minister of Commerce, Minister of Broadcasting, Associate Minister for ACC, and Associate Minister of Education. In was in this latter role that Mr Foss, on Tuesday 10 April, proudly announced the education sector’s first PPP. Over the next 25 years, a private consortium called Learning Infrastructure Partners will construct, administer and maintain Hobsonville Point Primary School and Hobsonville Point College. At what cost to the taxpayer, and at what rate-of-return to Learning Infrastructure Partners, we are not being told. Such information, according to Mr Foss, is “commercially sensitive”. A good deal all ‘round for the taxpayers, for the Government, for teachers, for boards of governors, for the pupils themselves. Boards of “governors”? Surely that should have been “trustees”. New Zealand schools haven’t had boards of governors for more than a quarter-century. That our new Associate Minister of Education was so ignorant of his portfolio that he failed to correct the error did not surprise me. But who, in the Ministry of Education, could possibly have made such a slip? Could it have been someone who’d only just arrived from a place where schools still have boards of governors? Someone whose last job was managing her country’s education infrastructure and funding? Surely, the Minister’s talking points were drafted by that proud promoter of Charter Schools and PPPs; Sheffield’s own ambitious lass; and New Zealand’s brand new Secretary of Education: Lesley Longstone? Ms Longstone is what’s known as a “change manager”. Her appointment is all the proof we need to convict this National Government of planning to dismantle New Zealand’s democratic and egalitarian system of public education – a system internationally acclaimed for its outstanding pedagogical successes. Assisted by Treasury Secretary, Gabriel Makhlouf, Ms Longstone will continue to put the words of the neoliberal ideologues who still run this country into the mouths of puffed-up political popinjays like Mr Foss. Who will, in turn, continue to receive six times the median income for putting young New Zealanders in their place. The place from which C.E. Beeby and Peter Fraser freed them, more than three-quarters-of-a-century ago. The Hon Merv Wellington made the decision to remove funding from WEA in order to have enough money to make a proper job of a new initiative. Hon Merv referred to "Language Nests", but we now call them Kohanga Reo. Hon Merv made the call that it was better to give more kids a running start at school than subsidise those who wanted to put right the years they had wasted there. Sharon Crosbie was the interviewer. Well said, Chris. Not only does National openly despise public education systems but they hate unions even more and the New Zealand Educational Institute is arguably the largest and most effective in the country. Much of what is being introduced is designed to break collective agreements and gag education leaders. Any National initiative has been no benefit to children but will only cause our top five world ranking in education plummet. Even though the Institute has a proud history of professional leadership and was originally formed as a professional organisation it has now been blocked from having any input on professional matters. All true, Chris, except for the fact that this will only end up happening because of the approval of the middle classes. It's the quickest and easiest way for them to hobble any competition from the lower orders, and to emphasise that education is now explicitly a competitive consumption good and that teachers are nothing more than servants. That's aspirational politics for you. What's going to happen when the dumb and greedy perpetually monopolise educational advantage? Having asked that, I think we may already be there. Paula Bennett is a cabinet minister. You’ve been on fire lately Chris, incisive commentary. The weird thing the tory turds don’t (want to) get is that because of the legacy of Beeby and many others lots of teachers via ongoing professional development and decades of practice merge talk and walk which has been acknowledged world wide. The ‘tail’ is the remaining problem which society not teachers alone via charter schools and performance pay needs to deal with. Boy Chris this has got you going! Typical leftie patronising – Nanny State knows best. To suggest cutting night classes learning guitar 101, or self discovery classes will bring down society is rot. I’m in favour of national standards and am very much interested in how my children are performing against nationwide benchmarks. Also I note Viki Buck (number two next to HC on your fantasy list) from the socialist Nirvana of the “people’s socialist republic of Christchurch” was a key player in bidding for a charter school, another Leftie (Rob Campbell et al) having an epiphany and finding the true path of the free market. Or maybe you advocate going back to the bad old days of taxpayers funding hip hop tours. Would bsprout be kind enough as to produce evidence of "Not only does National openly despise public education systems...."" ? It does seem that all National's new policies are either discredited neoliberal policies or crude political power plays. Hopefully the country gets rid of them before they do too much damage. If we go back to first principals, it is parents who are primarily responsible for their children's education. This is a role that they can legitimately delegate to others in terms of its functional outworking, but not when it comes to ensuring appropriate outcomes for their child. The problem with 'State delivered everything' is that far too many parents now believe that it is teachers who are responsible for their children's education, and all they have to do is send them off to school and all will be well. Of course, if we outsource everything to the State, including our education, healthcare, accident insurance, unemployment insurance, and retirement planning, then there are no 'adult' decisions left for anyone to make as they are all made for us. This is where we have arrived in New Zealand, from a nation of self reliant pioneers, to a people of perpetual adolescence, in the space of 150 years. And you seem to want more of it? What an extraordinary, and dangerous, attitude to child-rearing, Brendan. Of course parents play a crucial role in child-rearing - especially in the first few years of life. But, unless they are willing to then expose their child to the wider world in which he or she will one day have to live without the benefit of parental guidance and support, they risk stunting their child's intellectual and social development. Most parents understand this - which is why, from the beginning of civilised living, human-beings have sent their children to schools. The more civilised the society, the more care was taken to spread the remit of education beyond the home. It is only in rapidly regressing societies, like the United States, that parents are actively preventing their children from freely interacting with the wider world. The move to home-schooling in the US is a certain sign of its weakness - not its strength. Having been involved in education for almost 40 years up until the end of last century I can tell you that you are quite wrong - most parents of middle class that I know are increasingly keen to send their children to private schools (even though they vote left) because they see the hand of the teacher unions in much of what is decided in educataion now. State schools are increasingly seen as second rate. Parents want national standards, it's the teachers who don't want them. Who owns the schools? Our New Zealand state system is increasingly looking like the education system in Ontario that I spent a year in some 20 years ago and you would have to be insane to want to copy that! Brendan, do you have children? No self respecting parent would expect the State to provide everything for their child, but in those areas where the State is active it needs to be the best that it can be. That is why we pay our taxes. There is no place for commercialisation in the successful provision of education. I'm impressed to note that even Jacqueline Howarth in today's NBR understands this. I often wonder how many of those who criticise teachers would go in front of 4engineering 2. I suspect not well and not for long. I've talked with enough parents to know that for many it's not be education that they think is better in higher decile schools, but the fact that their kids won't have to mix with nasty rough kids, particularly nasty rough Polynesian kids. And I would like to suggest that the most effective union in this country is obviously the police union. New Zealand´s primary and secondary education is good. Most countries dream of getting results like ours. New Zealand´s teachers should be congratulated not criticised. Our education system is not perfect, the best students do very well but we are not the best in the world because our worst students do so badly. Nationals plans of charter schools, parental choice and this idea of parental responsibilty will just make this problem worse. You appear to have imposed your own 'filter' over my post. No where have I argued that parents should not send their children to State schools. I expressed the view that parents were primarily responsible for their children's education, and for the outcomes even if they choose to out-sorce that responsibility. In other words, they could not simply rely upon teachers to educate their kids. Graham, not only do I have five children, the last of which was married last weekend, but I have ten grandchildren. Two have trained as teachers, one is still teaching the other is a director of ICT in a private school. I have served on the board of both private and integrated schools, my wife on the committee, as it was then, of our local state primary school. In my opinion there is definitely a place for home schooling, although our children were never home schooled. I can tell you from first hand experience that without exception, all of the home schooled children I have ever met exceeded the educational achievements of their state school / private school peers, and were more socially adept with adults than children their own age. It would be interesting to see some objective research in this area, but then I suspect that most academics have a predilection which would prevent an objective assessment. Maybe that's just my bias showing through. Jigsaw is correct. The teacher unions have done more to protect the interest of their members, than they have the interests of children ever since they have been in existence. Nothing will improve in the State system until this self interest is addressed. Would that all children were as well adjusted, and able as those home schooled children I have met. New Zealand would have a much better future than the one it faces today, with its long tail of education al underachievement, and institutional excuses. "The teacher unions have done more to protect the interest of their members, than they have the interests of children ever since they have been in existence." That's their JOB Brendan - otherwise they'd be a student union. "That's their JOB Brendan - otherwise they'd be a student union." *chuckle* actually you are quite correct! I suppose what I'm really getting at is the disingenuous nature of the Teachers Union who 'claim' that their influence generates the best outcomes for students. I am completely at loss of words when National wants to keep what should be public quiet by using the new catch phrase "commercially sensitive". Why would education be even thought of as commercially sensitive?? Looks like Animal Farm to me. Those who are wealthy are more equal than those who are not. Their actions prove it.. Great article, thank you. Yes, I love the thought of that state funded schooling, and equality, and mourn the loss of the USSR. Me 'n the kids (all equal of course), well, we are off to Greece to live. See you there, comrade Trotski? Yeah, but what about that Sputnik, eh? Would bsprout be kind enough as to produce evidence of "Not only does National openly despise public education systems....""
Albert-As soon as they became Government they gave private schools $35 million and are currently providing Wanganui Collegiate with $800,000 as they negotiate to become an integrated school. They are dismantling our state system by introducing charter schools and are committing to PPPs even though Treasury has advised there are few benefits. The Government supports secondary schools that adopt assessment systems that don't support our National Curriculum. Our public education system managed to be rated in the top five in the world and must be judged as a successful system by world standards. Despite this Anne Tolley stated at last year's National Party conference that the system needed systemic change and private models are being introduced to progress that change. Although New Zealand administrators are well regarded internationally the new CEO of the Education Ministry is from the UK and led the introduction of the equivalent of Charter Schools there. Organisations like NZPF that represents Primary Principals from public schools (and are a professional group, not a union) have their opinions ignored and is publicly denigrated. National clearly doesn't like our public school system and wants to replace it with private models from the US and UK, countries that are ranked well below us internationally. If National liked and supported our public school system they would not treat it with such disdain.